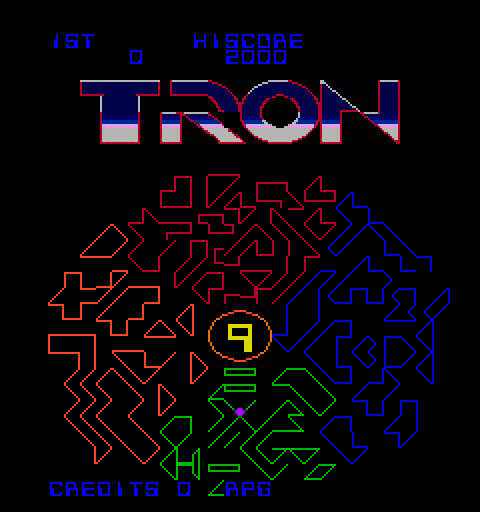 Produced by the Bally/Midway Company in 1982, Tron will challenge you and the whole family. With this exciting game, each individual player selects their own mission. This is a classic coin operated video arcade game presented in a miniature cabinet or "cabaret" which features an attractive wood grain finish. Its trimmed down size makes it idea for those game rooms with limited space. All video arcade games are thoroughly tested and are 100% working. Unless otherwise noted, all coin operated video arcade games come complete, including locks with keys, working coin mechanisms and the operation manual for the arcade game. These are real arcade game machines. We make a special effort to thoroughly describe our video games so you'll know more about what you are buying. We not only tell you about its current condition. We provide you with its repair history (at least what we know about). Don't be fooled by others who claim their video arcade games to be 100% working, only to find out they meant barely working once you get the machine home. Used machines are rarely perfect and although 100% working, their conditions can vary greatly. So be sure to check out our condition statement. Control Panel Control panel is in fair condition 9.5 Buttons and joy stick in excellent shape. Overlay has significant wear. New overlay included. Prices and conditions are accurate at the time they are posted. Changes can occur between updates. Prices and conditions may not reflect changes at the time they are viewed.